Wifestyles Blog & Photography: Fall Festive! Who said it was to early to start decorating and getting ready for Fall? I don't know about you guys but I am beyond ready for a change of season this year! Fall is calling my name! Bring on the apple cider, hayrides, pumpkins and pumpkin spice scents, leg warmers, comfy sweaters, scarfs, football games, caramel apples and SO much more! I'm ready! Is it just me or does Fall have the best fashion? I seriously LOVE me some comfy/baggy sweaters, leggings, boots, cardigans, leg warmers, SCARFS... the list goes on and on! I am ready to bring out my Fall wardrobe and add a little more to it! How cute are these two outfits? I labeled my "must haves!" Denim is super in this year and I really need to find a good place with denim shirts! So if you know anywhere let me know! Ah... are you guys excited? Justin and I got a bunch of apples from his grandma's apple tree and I'm in the process of peeling and freezing for Fall! 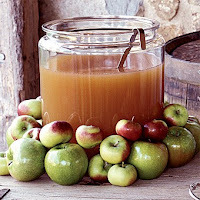 I've been seeing a bunch of great apple recipes and I'm dying to try some! 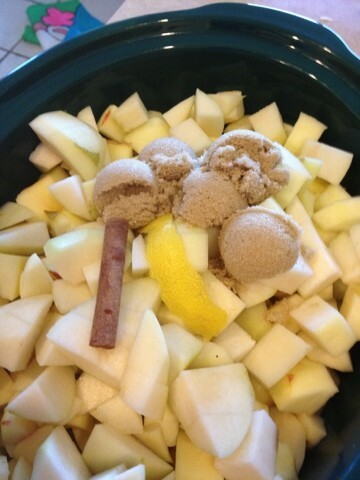 Homemade Apple Cider and Crock pot Applesauce! I've also been feeling super crafty lately and am planning on attempting both of these Pinterest DIY crafts! Simple, easy and SO pretty! 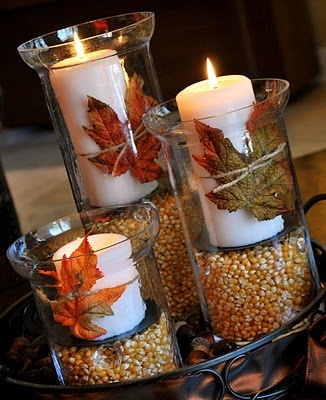 Either of these would make great centerpieces for Thanksgiving! Here is a little preview of our house at the moment... It feels super cozy! What are you guys most excited about?! I am right there with you, I LOVE boots and scarves and as much as I'm a summer girl I absolutely adore getting all comfy and cuddly when the weather gets cold! I am obsessed with all thing Fall,and I LOVE the fact you've already decorated! whoa, girl, you're like me and christmas! always have the decorations out way before most others! i just can't get myself to decorate for fall right now, since the temps are still in the upper 90's! more power to you, though! ;) it does look really cute! and homemade applesauce is the best thing in this world. yum! and, that second outfit is going to be my fall staple, i can already tell! i just got the cutest denim shirt from h&m! and it's the same place i got mine last year too, so check them out! they have a good selection. also, forever 21 has some cute inexpensive chambray/denim shirts! both of those outfits are too cute!! I love the orange purse in the second one. Oh my goodness...pumpkin spice, apple cider, and riding boots - yes please!! I am excited for all of it! I just want some cooler weather and anything else is icing on the cake!!! How cute! I love all of your outfits and home decor! I'm new to the blogging world and I love reading your site. xoxo. With my growing belly I'm all about the cooler weather-I've got a space heater attached to me at all times now! ;) I'm so excited for leggings and oversized shirts. Oh sign me up!! Your house looks so great!! 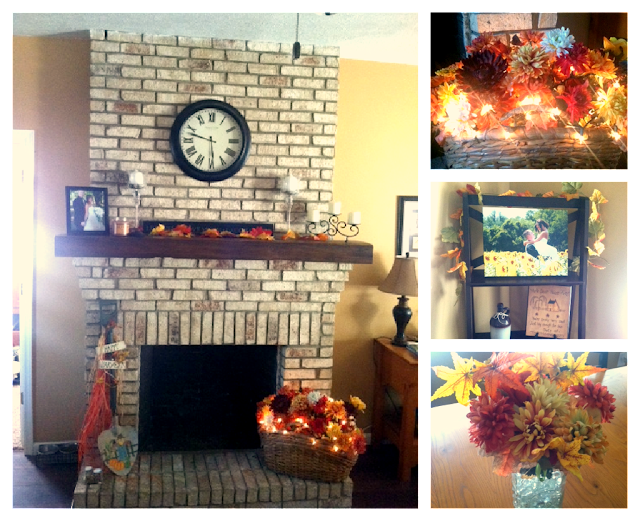 :) I can't wait to start decorating for fall! Ohh, now you know I LOVE this post. I need those outfits & apple cider! I checked our local Starbucks today & Pumpkin Spice comes out August 31st, woo woo! 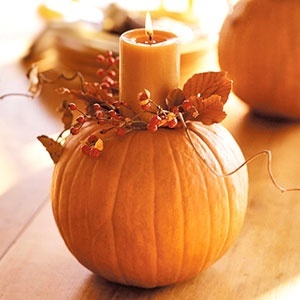 Loving the fall DIY decor :) Your house already looks so cute with fall fun! I just found your blog from....ummm I can't remember whose blog - but when I saw this post I knew we would be good bloggy friends! yay for fall - I'm super bummed because my husband and I are having our house built DURING fall (now until November) so I can't decorate my home for fall this year....(living with the rents til ours is done...) but I was just telling my mom today that "I bet it's ok if we start decorating" - I'm glad I'm not the only one! haha. Excited to be your newest follower! After I was catching up on your blog last night and saw this post I got inspired to start pining away on pinterest..I can't wait to start making some DIY fall decorations!!! Just found your blog and love it! Fall wardrobe...I NEVER want it to end! It's my favorite of any season! I am also in search of a new oversized denim shirt...going to check out Forever 21 and maybe J.Crew. I want both of these fall outfits. So fabulous!! !